SECRET HAND BEHIND TERRORISM IS YOUR OWN GOVERNMENT!!! [WeeklyUniverse.com]Is there such a thing as a "terrorism expert?" asks author Paul Collins. He answers: "If the events of 9-11-01 taught us nothing else, they showed the world that destruction can be both swift and decisive. While September 11 is a day and event that will last forever in the minds of the citizens of the world, it is in no way the first nor the last act of terrorism that we will face." 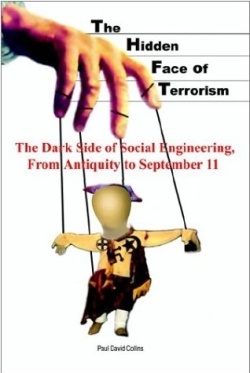 According to Collins, his book, The Hidden Face of Terrorism: The Dark Side of Social Engineering, From Antiquity to September 11th, "raises serious questions about both the supposed history and uncertain future of terrorism in the world. From ancient Rome to the World Trade Center, some largely ignored and understated facts show a disturbing truth: Most terrorist acts throughout history have been state-sponsored enterprises!" Collins adds: "This book was written to warn the American citizenry of the grave threat to their liberties and the emerging garrison state being built under the auspices of 'national security.' It was also written for the peoples of other nations who face the potential of hostile occupation under the imperialistic expedition led by the Eastern Establishment's foreign policy cartel. "The Hidden Face of Terrorism avoids conjecture and speculation, instead focusing on facts and statistics. From the burning of the Reichstag to the Northwood Plan, from the Oklahoma City Bombing to the destruction of the World Trade Center, The Hidden Face of Terrorism establishes a plausible and honest connection between the power elite and terrorism." Paul Collins says that he's studied suppressed history and the shadowy undercurrents of world political dynamics for eleven years. He completed his associate's degree in 1999 and is currently working on his bachelor's degree with a major in communications and a minor in political science..
Collins is a member of Phi Theta Kappa and Phi Kappa Phi honor societies.. The Hidden Face of Terrorism is his first work.